Like any Saturday night Roppongi was teeming. Train after train of visitors spilled up onto the streets: couples, families, groups of old ladies and the characteristic old man coupled with young lady all mixed as they headed for their respective destinations. As the sun set on the concrete byways, crowds of people flowed steadily toward the lit façades of the Roppongi Hills or Midtown complexes, or the National Art Center (NAC) and Suntory Art Museum (SAM). Tonight was a highly publicized area-wide event, where from sun-set to sun-up “large-scale art installations and live performances to delight the sense” were placed around the area. What is it to try and turn a whole urban area into ‘art space’? How are we to take in such a large-scale event? Regular art venues like the NAC and SAM were open for later hours, these spaces obligingly opening their doors and their grounds to visiting series of art works: 2x2m “Art Cubes” by a variety of artists, curated by Katsuhiko Hibino. One series of cubes by younger artists entitled “Orders from the Cube” had set guidelines to include a rotating vertical axis through the middle of the cube. Each artist was thus confined to include in this space some rotating centerpiece, a theme that gave each cube the feeling of containing a heavenly body or a Christmas ornament. One work did stand out; ‘Bud of the Typhoon’ (台風の芽) had as its centerpiece a brown papier-mâché tornado that instead of spinning freely like other works was intentionally designed to get hung up on each rotation, thus breaking up the repetitive feel of endless turning. 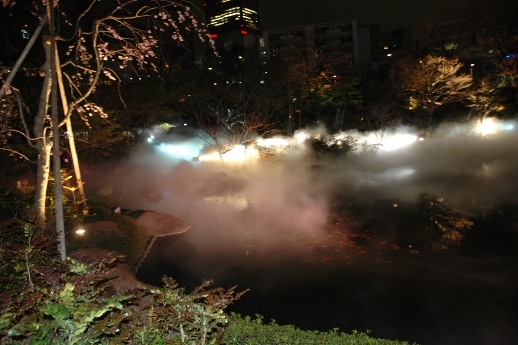 Behind Roppongi Hills were larger works, a light and fog installation, ‘Forest of Fog’ by Fujiko Nakatani. 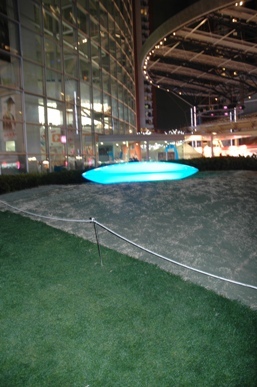 Originally constructed in 1992, the work was installed in the rear garden creating billowing clouds of fog backlit parallax across the viewing pond. The serene, hot spring-like nature of fog over water and silhouettes of trees was completely destroyed by sound spillage from the accompanying food court and Giant Robot arena. One could not tell if this exhibit was really meant to be viewed or merely passed by, “delighting the senses” on your way to the vendors. As a result, this much anticipated work was rendered mostly ineffectual. Everyone was gravitating toward the most heavily promoted event of the night, a giant fire-breathing robot, Kenji Yanobe’s ‘Giant Torayan’s Great Adventure’. Having seen the publicity photo of this towering, shinny, baby-faced robot blowing fire, the crowd stood with cameras poised for the promised moment of excitement. The atmosphere was thoroughly like a carnival or festival with no small amount of Universal Studios, as people passed around this work, seamlessly moving from ‘art space’ to window display, from purportedly ‘interactive environment’ to beer vendor. The live music that kept people’s attention rose in crescendo and the robot’s mundane shuttering was broken by awaited bursts of flame, people snap photos and move on. Any reflexive commentary this work might embody on, say, amusement parks, or fascination with giant robots was rendered nil by the atmosphere that rather encouraged a superficial Disney Land-style engagement. One of the uses of space that interconnected the whole area was a procession of people holding illuminated balloons weaving through the crowds. This stream of lights formed veins of bobbing white globes showing the different paths and elevations of the urban architecture, and indicated by the flow of people through the space. Following one stream as you moved from the Roppongi Hills area toward the newer Midtown and NAC there was a change of tone and the works on display became more independent and less attention-grabbing. One wonders if it is the nature of the works selected or the audience for which the event was curated, but I couldn’t help feeling for the most part the subjugation of any ‘art space’ to the demands of a family and consumer-friendly environment at this event. How is one to engage with works that you are herded past like a carnival line, or where the ‘work’ is placed in front of brighter, more polished and more appealing commercial store-front displays? 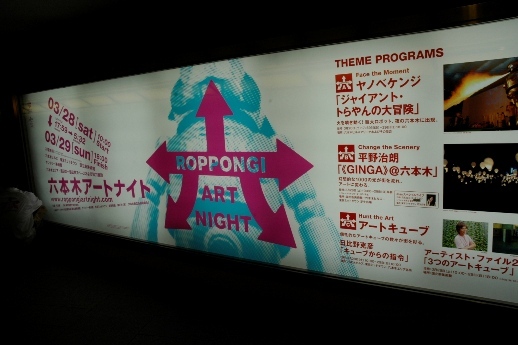 I was very pleased to see the simple number of people who had come out for an evening where “the entire townscape of Roppongi transforms into a giant canvas of encounters with art, culture, people and wonder,” but the dominant impression was of the art works’ convenient accompaniment to people socializing and businesses selling, all in an attempt to heavy-handedly forward Roppongi’s claim as an area wealthy in cultural-capital. For more, see TAB’s photo report.